My 2014 goal to try something new each week continues. Today I decided to make Asian steamed dumplings. I always think of my dad when I cook Asian. He loved Asian food, especially the variety of all the appetizers. For my birthday when I was younger he would take me to Victor Lim’s in downtown Detroit, where I was treated like a queen. When I was in high school my younger brother’s band played in a Chinese restaurant–no, you can’t make that stuff up–and every Saturday night we would go, eat and enjoy the music. So I was excited to try the dumplings. Something, however, always gets lost in translation. The items that come home from the grocery store with my husband aren’t always the items I swear I wrote down. so I adjust. This time however, it wasn’t just the ingredients I adjusted. 1. In a large bowl mix the filling ingredients with a fork. 2. Take one of the wontons and wet the edge, all the way around the circle. 3. Place approximately 1 tsp. of the filling in the middle of the circle. 4. 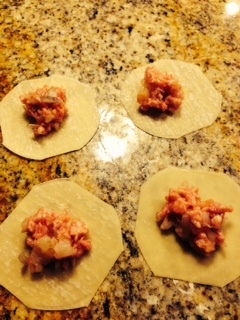 Fold the wonton in half and pleat it closed. What is pleating you ask? I did too and I found a wonderful YouTube video that showed me how. Here is the link: http://www.youtube.com/watch?v=hJtZPRAQoeM . 5. Place in bamboo steamer and steam for 8 – 10 minutes. 6. To make the dipping sauce, mix all of the ingredients in a jar and shake. Let it sit at room temperature until you are ready to eat the dumplings. Here is where my inventions began. I had no scallions–so I substituted shallots. I’m guessing any kind of onion would be okay. e corners off so I had a “sort-a-circle”. After scouring the pantry, all of the cupboards, the basement — every nook and cranny I remembered that my bamboo steamer was at the cottage. Hmmmmmmmm, I said as I tripped over the box of aluminum pie pans in my pantry. (Left over from the over 100 apple pies my NHS students and I made last fall.). The light bulb went off. I took my large enameled/cast iron pot and filled 1 inch of water in the bottom. I placed a metal measuring cup in the bottom. I took three of those aluminum pans and using a fondue fork poked holes in the bottoms. I brought the pan of water to a boil and set the first pie pan on top of the inverted measuring cup. 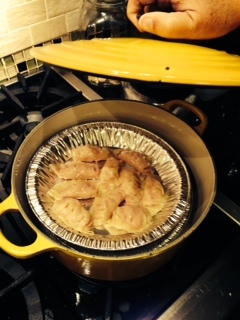 I loaded the pan with dumplings. I did another layer of dumplings with the same technique. The third layer was just dumplings. I put the lid on the pot and steamed the dumplings for 10 minutes. Ta da! The invention worked. I must confess though, I did not invent this unique steamer technique. I know I saw it somewhere, I just don’t know where. Thank you to whoever put it out there. My husband was so delighted with the results that he asked me to pack him a lunch with the leftovers. I was delighted. Think of all the unique things you could put into these dumplings. Yum! It Doesn’t Have to be Pretty . . .
Today, on this -22 degrees below zero wind chill day with winds blowing over 30 miles per hour I decided to make my husbands favorite treat. Bagels. I have known him for almost 40 years and every morning of those 40 years he has had a bagel for breakfast. He loves bagels, especially homemade. 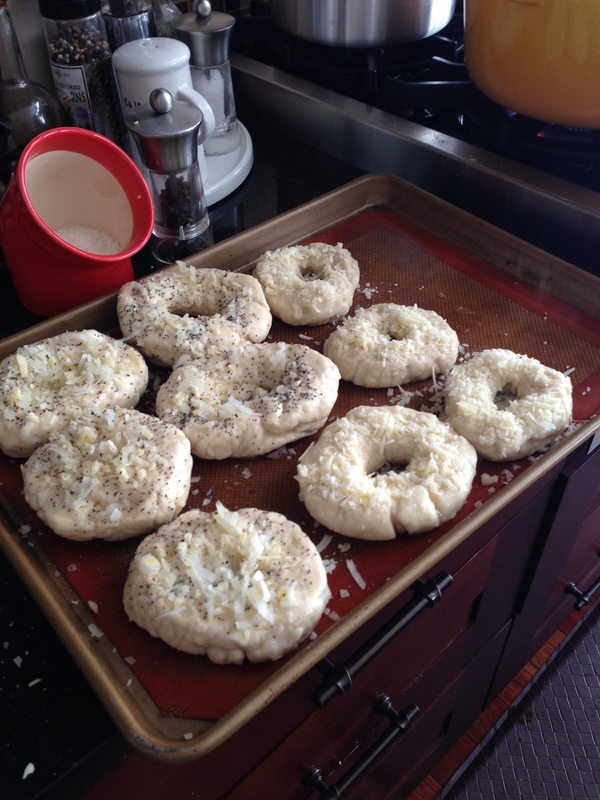 My whole family loves bagels–including the babies! Well, Abbott (almost 5 months old) doesn’t know yet about bagels but I am sure he will love his G’s bagels too!I’m just saying, every time I make bagels they look different. Oh dear mother though, they always taste great. Perhaps I failed to blossom in geometry–that may be why they are never perfectly cylinder like the ones in the packages. I like texture, so they are never perfectly smooth, and besides, all those nooks and crannies allow more toppings to stick. So I am happy with the results. 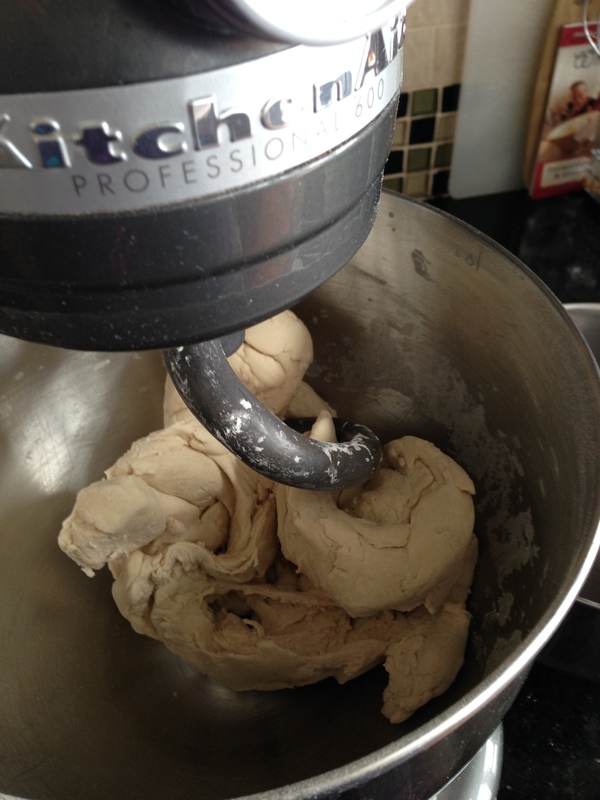 In mixing bowl, fit with a bread hook, combine 1-1/2 cups flour and yeast. Mix water, 3 tablespoons sugar and salt together, and add to the dry ingredients. Beat with a mixer for half a minute at a low speed, scraping the sides of the bowl clean. Turn up the speed for 8 minutes. If you need more flour, add up to a 1/4 cup. 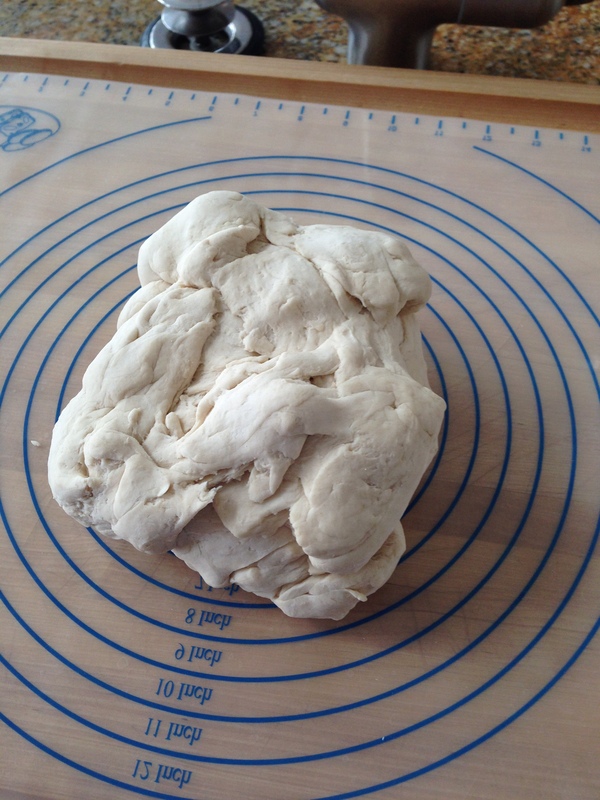 The dough should pull away from the sides and form a ball. It will be a stiff dough. Cut into 12 portions, shape into smooth balls, rolling vigorously. . Poke a hole in the center with your finger, and make the hole larger while working the bagel into a uniform shape. Cover, let rise 20 minutes. Take a large pot and start boiling a gallon of water. 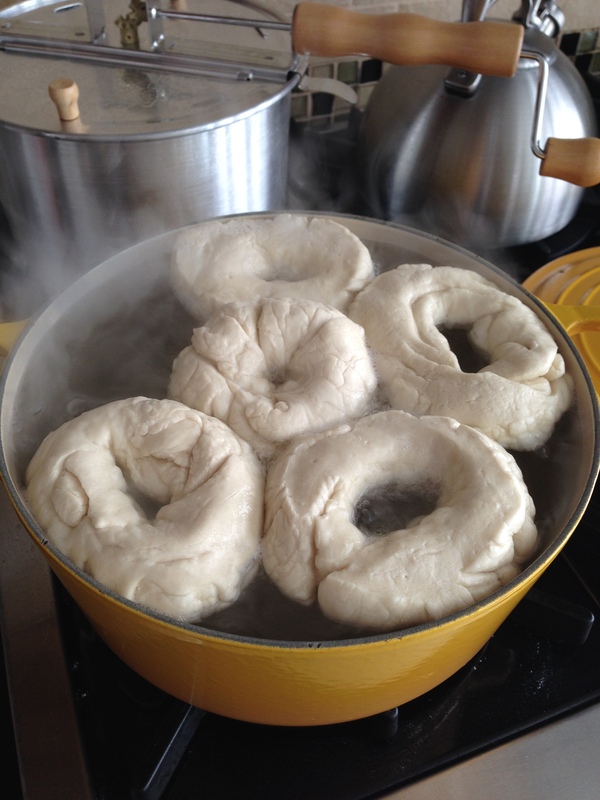 When the bagels are ready, put 3 or 4 bagels into the water, (don’t crowd them) and boil for 7 minutes, turning once. Drain them. Place on a greased baking sheet, paint them with an egg wash of 1 beaten egg with a shhh of water. Add your favorite toppings, and bake at 375 degrees F for 30 to 35 minutes. You have heard of everything bagels. I make anything bagels. Anything I happen to have that looks good. 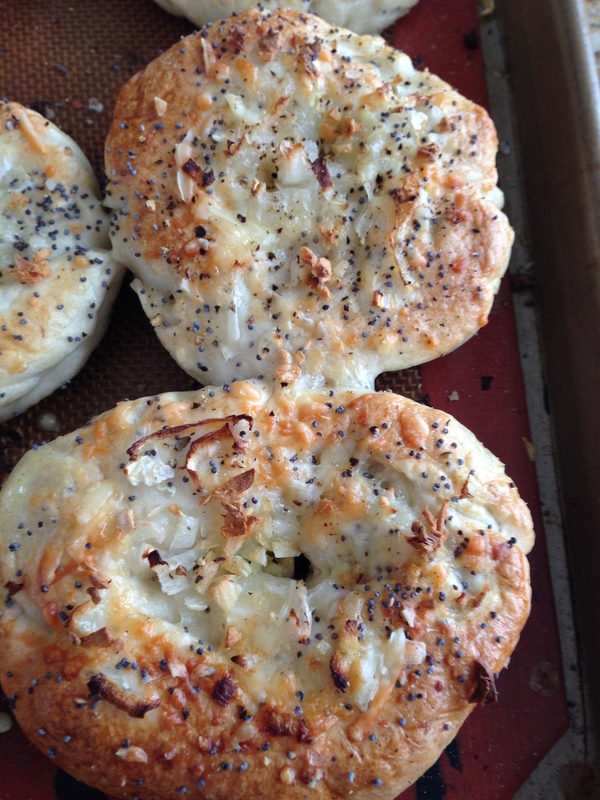 Today my anything bagels had chopped onion, chopped garlic (powdered will also work), grated romano cheese, poppy seats, salt and pepper. Enjoy. Remember, they don’t have to be pretty. Animal Crackers (not in my soup)! Have you ever looked at the expiration dates on some of those animal cracker boxes. Yuck. Plus all the chemical and preservatives in them. Plus the cost! Well these little darlings are yummy, less expensive and can be custom made for the favorite animal of the week. These little chickies, bunnies and flowers are a spring time favorite. I’m currently looking for mini dinosaurs. Over a small bowl, whisk together the dry ingredients: the flour, baking powder, salt, and nutmeg. Oh heck, throw in a dash of cinnamon too. Set aside. In the bowl of an electric mixer fitted with the flat beater, beat the butter on high speed for 2 minutes until it is fluffy. Reduce the speed and slowly add the sugar and beat for 2 minutes, stopping the mixer occasionally to scrape down the sides of the bowl. Add the egg and vanilla and beat for 1 minute, stopping the mixer once to scrape down the sides of the bowl. Add the flour mixture. Beat on low speed until the flour has been absorbed and the dough starts to pull away from the sides of the bowl, 2 to 3 minutes. When ready to cut and bake, preheat an oven to 350°F. Pick out your favorite mini shapes and prepare your baking sheets. I use Sil Pats and love them but you can use parchment paper or cooking spray. Roll out the dough to about 1/8”. Dip circus cookie cutters into flour and cut out the shapes. Freeze the baking sheets for 15 minutes, or refrigerate for 30 minutes. Bake the cookies until lightly browned, 14 to 16 minutes. Transfer the baking sheets to wire racks and let the cookies cool to room temperature. Don’t know where I got this recipe, but currently I have it written on the back of an envelope. Must have been waiting in a doctors office reading their magazines. Can you relate? They also make nice little puppets for having pretend conversations in squeaky voices with your grandchildren. After all, only a grandma lets you play with your food. I couldn’t believe his reaction to the homemade ricotta and homemade calzones! Ah, ricotta is simple–just some milk, cream and an curding agent like vinegar or lemon. Done. Bring the milk, cream and salt to a boil and turn off the heat. Add the curding agent and let sit for 2 minutes. Line a sieve with a coffee filter. Some people who are better prepared may have used cheese cloth, doubled. Pour the hot milk mixture into the sieve/strainer, over a deep bowl, and let sit for 45 minutes! Wah laa! (Is that how you spell it?) you have ricotta cheese. Transfer to a bowl, use immediately or keep refrigerated and use within 4 days. You will not believe the difference in taste. Hmmmmm, what to do with it. Calzones! Hubby thought it was a great idea and even offered to get the ingredients he thought missing. I had frozen pizza dough I had made last week, but my sister-in-law uses frozen bread dough. I thawed that, rolled it out into a 10-inch circle and placed it on a lightly oiled and cornmealed baking sheet. The ricotta, provolone, mozzarella and parmesan were spread on one half of the dough leaving an edge for sealing. Think of all the things you could put in this. Pepperoni, ham, veggies, kalamata olives and the list goes on. 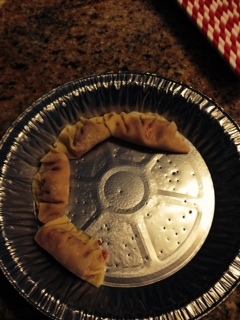 Fold the dough over, making a half circle and roll and seal the edges. I like to top mine with an egg wash and a little more parmesan. Bake at 400 degrees for 18 minutes or until golden brown. I think Etta, 2 years old, will have fun making these with me! Excellent idea Emily. So ladies and gentlemen watch for the launching of my 2014 cooking experiments via: In the Kitchen with G! Of course you are going to have to read about my crazy life and family too. Here goes . . .